There has been much comparison being made between Wednesday's tornado outbreak and that of April 1974. It's a shame that we don't have Ted Fujita around anymore to do a painstaking areal survey of the entire region affected on April 27th. I think that it's interesting to take a quick look at radar data available then and now. 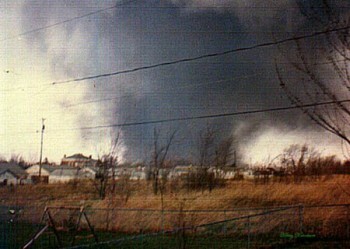 Above is a photo of the April 3rd, 1974, tornado that struck Xenia, Ohio. Below the photo is a screen shot of the nearest WSR-57 radar image at the time of the tornado. 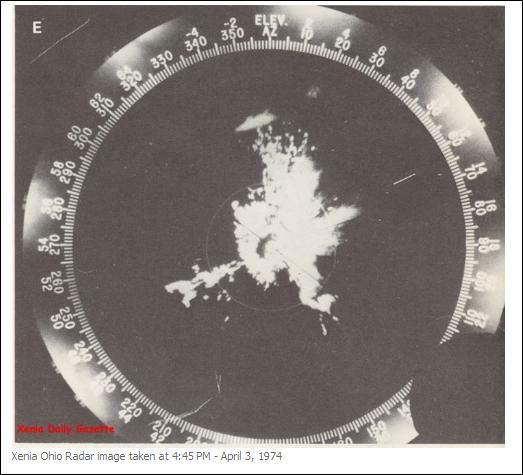 The radar data had not yet even been digitized, so the operator had to modulate image brightness to help interpret what the radar was detecting. Very crude radar technology back then, but the hook echo appendage on the Xenia storm is quite obvious. Top image here shows Wednesday's tornado approachng Tuscaloosa - view is from further away but the tornadoes are somewhat similar in visual appearance. Bottom image is from the NWS Birmingham Doppler radar. Right panel is reflectivity capturing the hook echo and also a large blob of very intense reflectivity that indicates a debris cloud associated with the intense tornado. The right panel shows the velocity display (radar is located off to the east and a bit south of the tornado). 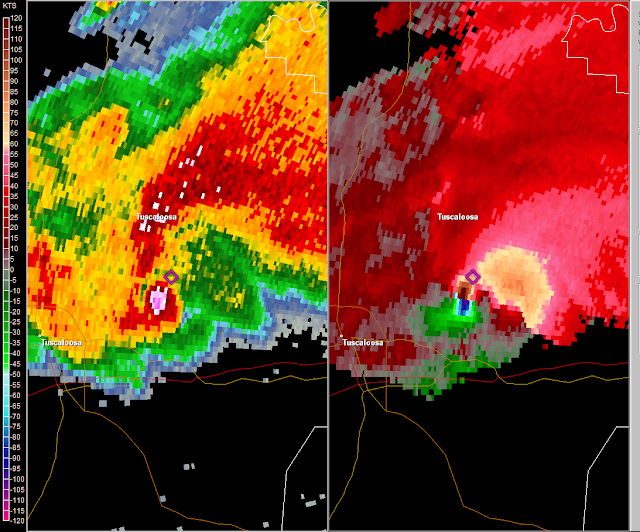 The velocity field is extremely intense and captures both a large mesoscyclone and also the tornado vortex signature. Clearly a tremendous improvement in weather radar technology and displays have occurred since the outbreak of 1974. Tornado records have been shattered and scientists can only guess when and where tornadoes will actually strike. 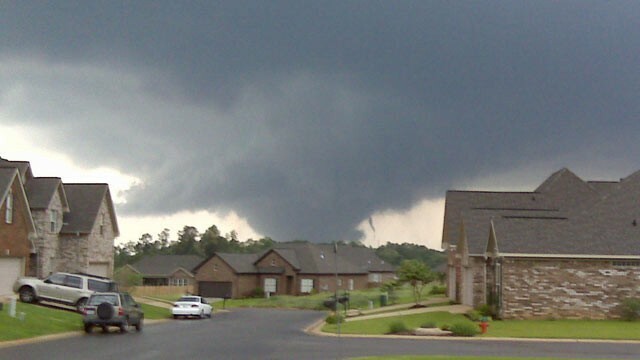 Tornadoes need warm, moist air interacting with faster, cooler air. That much scientists know for sure. “Tornadoes are tougher,” said Jeff Masters, director of meteorology at Weather Underground, an Internet-based weather service. Many climate models, for example, predict a weakening upper atmosphere jet stream over time on a warming planet, Dr. Masters said, which would presumably create less energy for tornado formation. But some of those same models also suggest wetter conditions in tornado country, which is the other key ingredient in storm formation. The population of the South grew by 14.3 percent over the last decade, according to the Census Bureau, compared with 9.7 percent for the nation as a whole. Of those states hardest hit by tornadoes this year, some were among the fastest growing, notably Texas and North Carolina. And yet, since that crucial element of weather prediction is missing — when and where the next tornado hit might come — the question of trust and faith, if not fatalism, is easy to find. If scientists cannot be sure — or trusted, as doubters of climate change might say — then where should an ordinary person on the ground turn for solace or strength in the raging maw of a storm? Red highlighting is mine - I can't go on about this; my bloodpressure is already redlining! When I quoted T. S. Eliot's "The Wasteland" at the start of this month little did I know what a month of extreme severe storms it would be for the southeast third of the US. The human tragedies have filled the news again this week. Shown above, from top to bottom, are the 1200 UTC morning Severe Storm Outlooks from SPC, with the preliminary storm reports overlain. The staff at SPC has had a challenging month and an especially active week, this last week of the cruelest month. My thoughts are with all the victims of yesterday's huge tornado outbreak. Even with the severe drought, there is some desert spring color showing up here, as per above photo. Coral yucca, mesquite trees, and palo verde trees are in bloom, with some palo verdes magnificently draped in yellow - but alas not ours. Unless there's a real surprise with the next system, it appears that April will come to a close with rainfall on one day only - 0.36" on Saturday April 9th here at the house. A number of days ago I posted the 168-hour GFS and ECMWF forecasts valid at 5 pm MST this Easter afternoon. The forecasts are at top and middle, and the verifying NAM analysis is at bottom. It appears that the GFS was clearly better than the ECMWF in this situation. The GFS was a bit too far north and fast on the vorticity maximum but the height forecast for southeastern Arizona was quite good. The ECMWF was too deep (quite considerably) and too slow - so a come-back performance by the GFS which beat-up on the ECMWF! 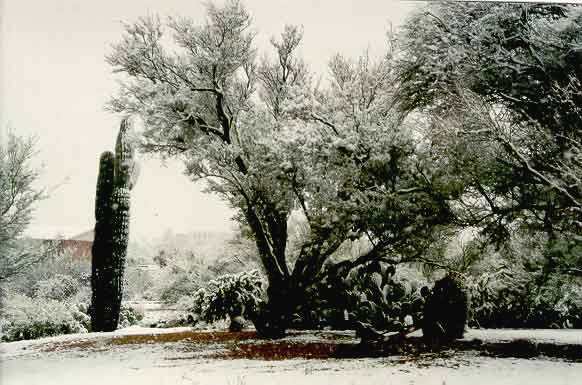 Easter Sunday in 1999 brought a rare April snowfall into the City, but none here at the house. 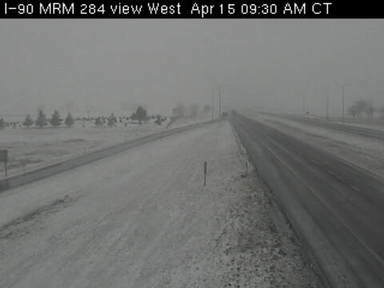 Easter in 199 fell on April 4- three weeks earlier than this year and it was quite a surprise to us to see a brief period of heavy snowfall over on the east side. 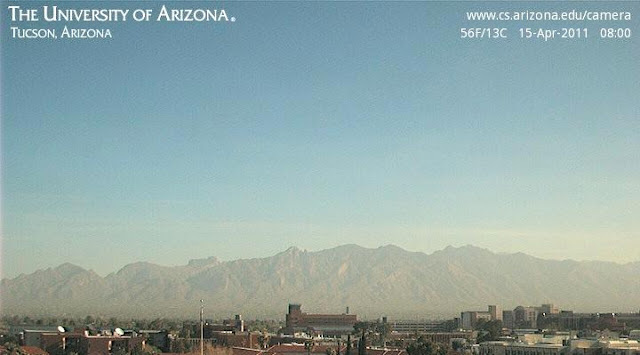 This year (2011) brings clear and very dry skies, as severe drought conditions prevail over much of the Southwest. Happy Easter to all. Strong, low-level, warm advection was associated with a couple of large MCSs early this morning (Friday April 22nd, 2011). Several of the NWS RRS soundings taken in the vicinity of the convective systems had problems, as shown above - just my attempt to keep up awareness of these fequent data problems. Brian Curran has sent along a link to fire photographs taken near the McDonald Observatory, which is operated by the University of Texas. 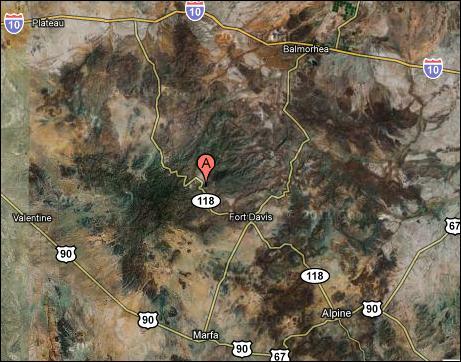 Map at top shows location of the observatory near Ft. Davis. The following link has a number of photos, as per bottom image, that were taken last week. 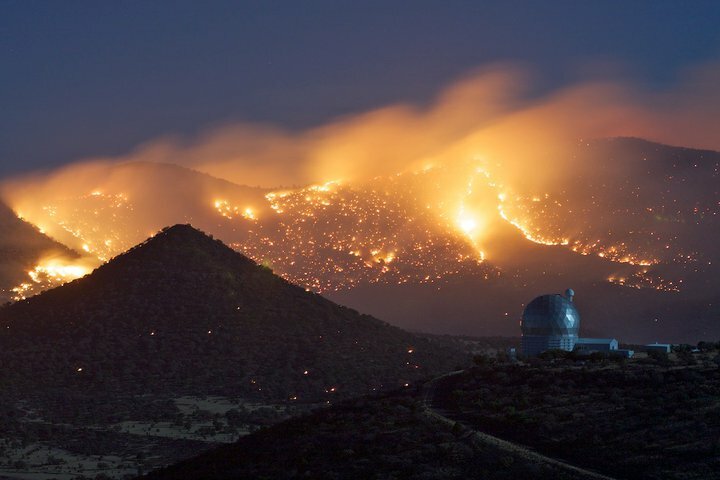 These were apparently back burns set to protect the observatory from the nearby wildfires. 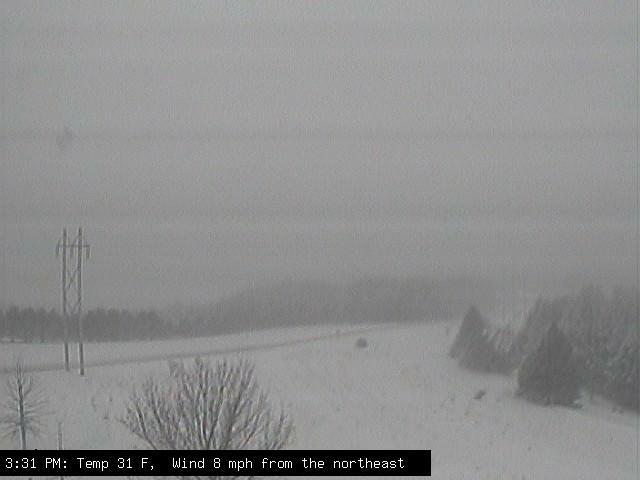 From the NWS webcam at La Crosse, Wisconsin this afternoon (19 April 2011). Sadly, the Heileman's plant in La Crosse closed in 1999. But the disused plant was purchased by the city of La Crosse and now the city - does any other city in US own a brewery? - is in charge of brewing the beer. They have resurrected the original name of the Brewery - "City Brewery"
Shots above are of a young, male Gambel's Quail standing on a windowsill of the house. 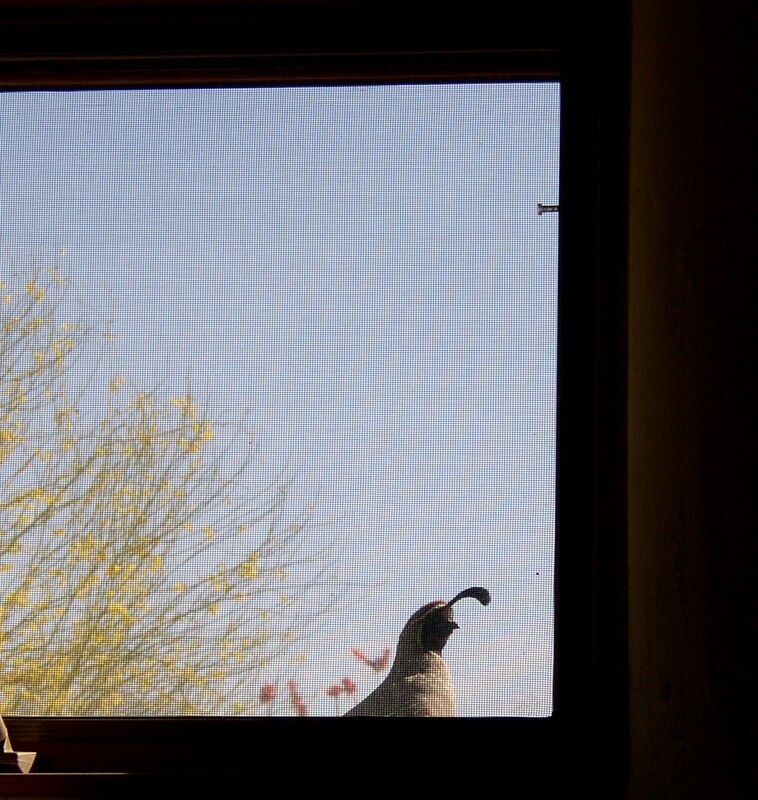 He's a bachelor plaintively calling for a mate from the high spot provided by the windowsill. The operational members of the GFS and ECMWF are again quite different at 168 hours from 00Z last evening (18 April 2011). Both forecast a negatively-tilted short wave at 500 mb slipping into the western US next Sunday afternoon. But the ECMWF (bottom) is much stronger and further south, which is somewhat typical when comparing the two models at longer time frames. Height differences indicate that the ECMWF is about 150 m lower than the GFS (top) over southern Arizona. Once again something to watch over the coming week. 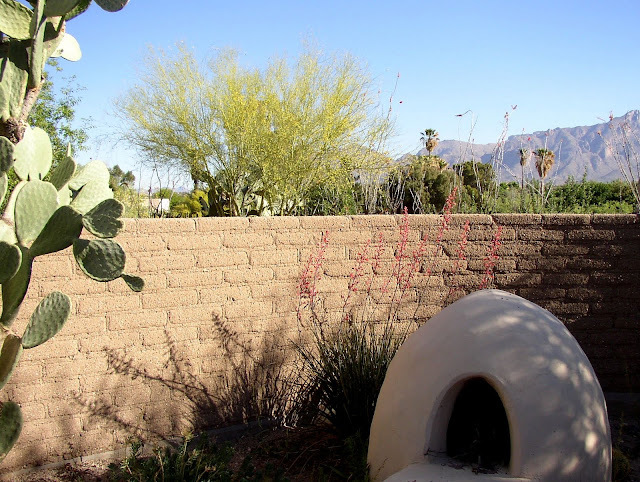 Meanwhile, we suffer under dry, mostly clear skies here in Tucson area, with the most interesting weather challenge being whether it will be breezy or windy during the afternoons. Further north, a distinct plume of high PW fromt the Pacific is impacting northern California to northern Utah/western Wyoming - see composite PW image below. Temperatures are warm with this event and most surface stations (bottom image) are reporting rain at 15Z this morning - note the moderate rain at Salt Lake City and snow in western Wyoming at Big Piney and Jackson. Large surface cyclone that was associated with severe storms in Plains yesterday and in Southeast today is currently centered over northwest Missouri. 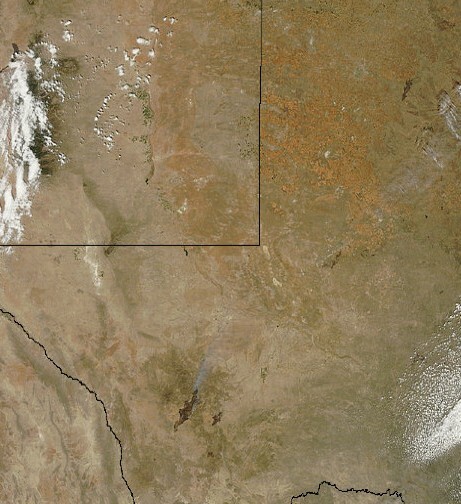 The system has a narrow north-to-south band of snow associated with it that extends from the eastern Dakotas across eastern Nebraska, as shown on the surface plot, at bottom, from this afternoon (15 April 2011). 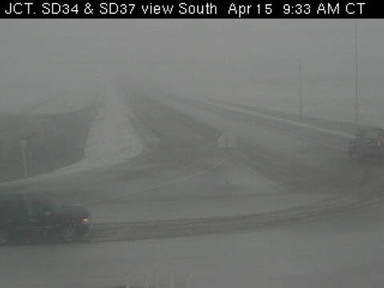 The two images at top are from Forestburg and Kimball, South Dakota is morning. No weather out here today, although strong winds the last two days left skies this morning a bit dirty with suspended dust - see below. Low this morning was 38F and current temperature at airport is 85F - so another day with big diurnal temperature swing. A pronounced dryline has pushed across central Oklahoma and northwest Texas this afternoon with very strong west winds to its rear, along with very low RH. 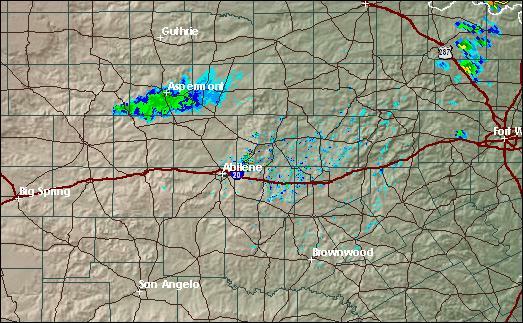 A current radar image (top) shows a large echo northwest of Abilene, which is apparently from a large wildfire. 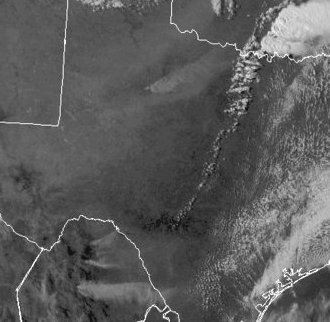 A concurrent visible satellite (bottom) captures a large smoke plume northwest of Abilene. Several large fires are also apparently burning in northern Mexico, near bottom left of the image. In earlier posts about the drought conditions over west Texas, BC had mentioned that they expected a serious wildfire season this spring. Over the weekend several large fires spread across thousands of acres, threatening parts of Ft. Davis and destroying many homes. 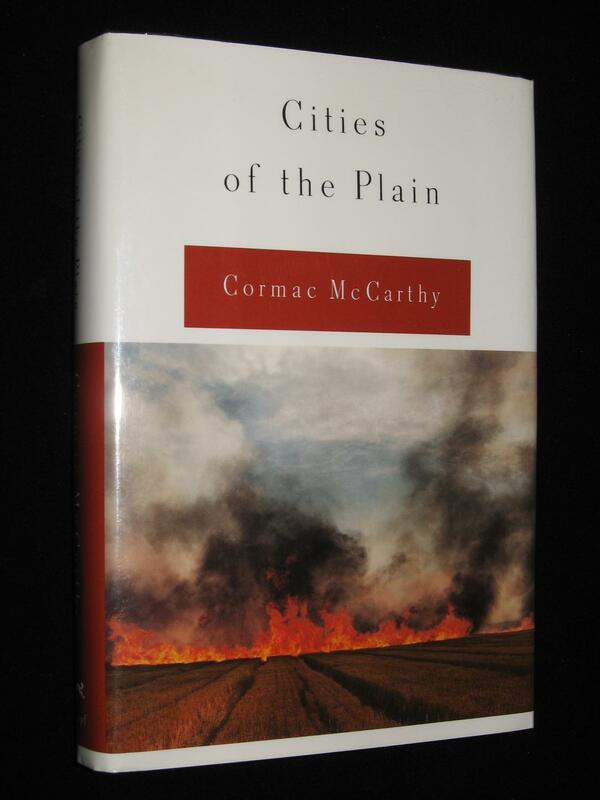 I had mentioned that this was Cormac McCarthy country. 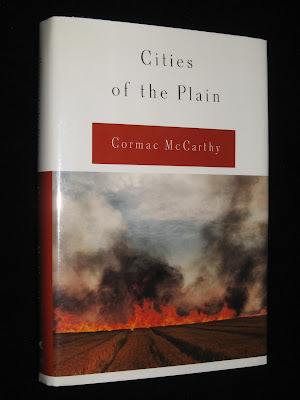 The top photo shows the dust jacket of his "Cities of the Plain", while the bottom shows one of the wildfires burning near Ft. Davis - quite similar. BC comments: "FYI. http://www.mywesttexas.com/ has more info on the Midland fire" and attached a MODIS satellite image (below) showing several of the fire scars in southwest Texas - the Ft. Davis fire scar has a thin smoke plume extending to its north-northeast. 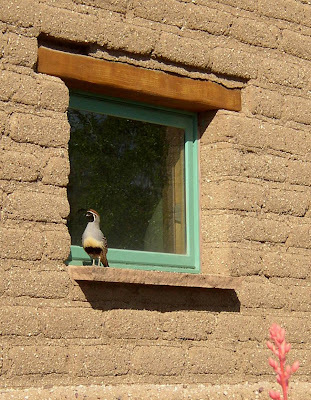 A bit more information from BC: The Chihuahuan Desert Nature Center (http://cdri.org/) has more info regarding the historic Rock House fire. Last report had the fire up to 250K acres at 60% contained. Burnouts at the Boy Scout ranch were successful, and burnouts/blading around the Girl Scout Camp Mitre Peak saved that area. A Type 1 team is now emplaced at Midland. It's not getting any better. We were away yesterday and did not experience much of Tucson's weather event, except the ending around dusk. Out northwest of Sonoita, Saturday was cold with strong winds and dust, and there were a few spits of light rain and mist from the heavy clouds. When we left a bit after 4 pm there had not been measurable rainfall. In fact, it appears that far southeastern Arizona had mostly winds from this event - I see that the Guthrie RAWS site had gusts to 67 mph and Ft. Huachuca had gusts to 54 mph during the day. Here in Tucson area the event panned out a bit better than indicated by the last model forecasts I saw. Amounts were much better at higher elevations with some reports of 0.50 to 1.00"+ (snow amounts were probably significant for this time of year). Here in the actual Tucson metro area amounts ranged from around 0.15 to a bit less than 0.50". 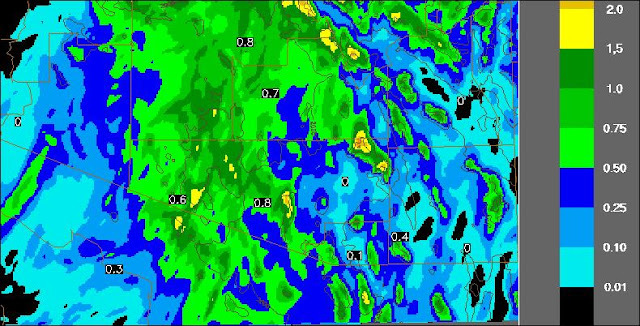 It appears that 100% of the ALERT GAUGES had rainfall - so, for most spots at lower elevations this was the best general rain event so far in 2011. Here at the house we had 0.36" with a morning low of 34F. Atmo reported 0.39". 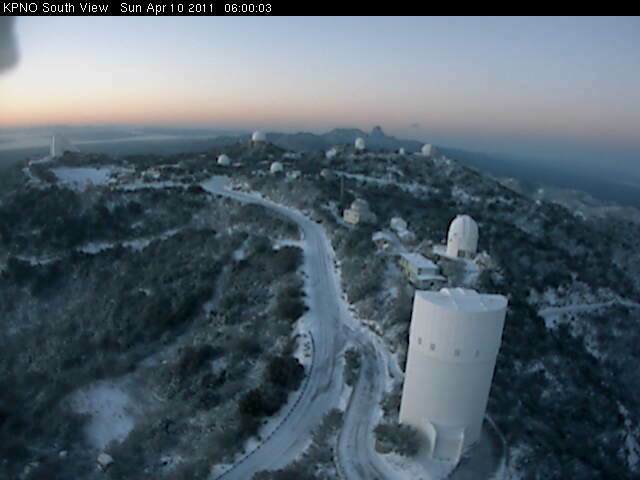 Views above show fog (a rarity here also) shrouding the campus this morning, and that the event produced some snow on Kitt Peak. Strong 500 mb cutoff is currently over central California and digging south. 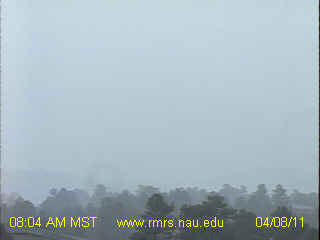 The system is already impacting northern Arizona - see top view looking north from NAU in Flagstaff toward the San Francisco Peaks, which are obscured in snow. The NCAR RAP 500 mb analysis for 12 UTC (bottom) shows unusually cold temperatures in the core of the system, with -35C, or a bit colder, observed this morning. The latest NAM forecasts indicate that a small pocket of 1000-500 mb thicknesses of 5340 m, or a tad lower, will move across southern Arizona tomorrow night - so snow levels will come down quite low for April. The U of A Atmo version of the WRF-GFS model run at midnight is forecasting another event that would affect mainly higher elevations of southeastern Arizona (see top graphic below). Much like the last system I followed, only very light precipitation is forecast for the Tucson metro area, but a nice event at higher elevations of the Catalinas and Rincons. This morning's 12 UTC run of the NAM model forecasts more precipitation at lower elevations, with up to half an inch indicated for the metro area (bottom image below). Note that both of the forecasts below are for total precipitation for the period ending at 12 UTC on Sunday morning. The last event tracked like this turned out to produce actual precipitation that was about an average of the two models. So, we will watch to see how this event evolves - definitely a return to winter-like conditions, which will be a nice respite. As the Pacific system (see previous post) came across Arizona yesterday morning virga, or showers, with mammatus were followed by very gusty winds that filled the sky with dense clouds of blowing dust. 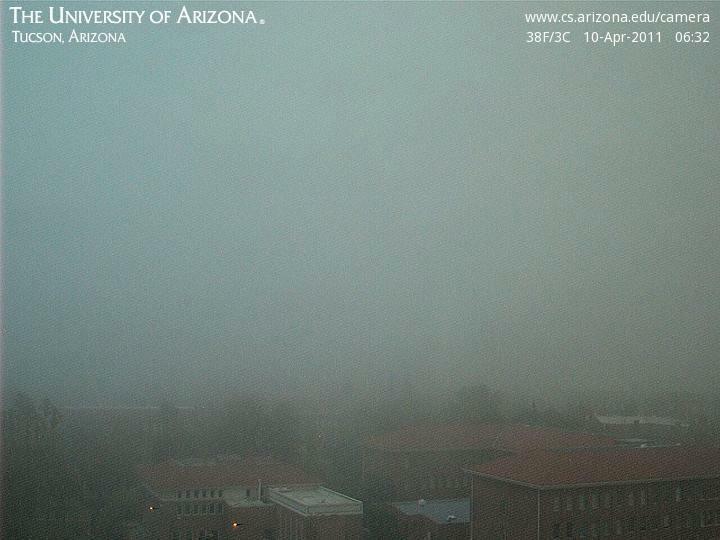 Not at all a pretty sight in the early afternoon - as per 2 pm view north from the U of A campus (top). 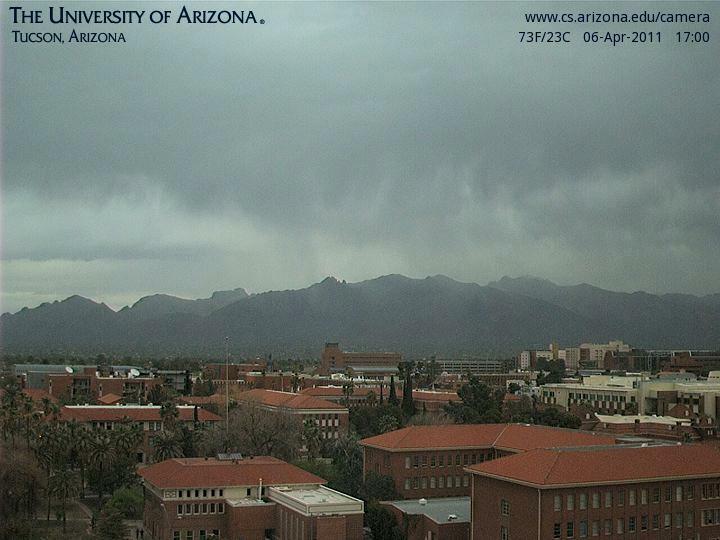 By 5 pm (bottom image) the dust was moving east, followed by another round of virga, showers, and mammatus. Here at the house we had a Trace of rainfall. 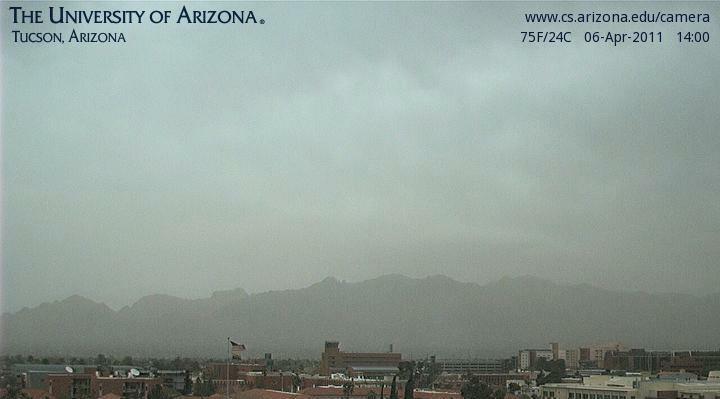 Wind gusts reached 40 mph at TUS, where no rainfall was recorded. Hopefully the colder and stronger 500 mb short-wave tomorrow night and Saturday will do better by us! The 500 mb cutoff west of Baja has become much better defined over last few days, as vorticity tails from the last couple of short waves curled into the system. The water vapor image from 1430 UTC this morning (top) shows the system with what appears to be considerable deep convection in advance of it. The blended PW product for 1300 UTC (middle) indicates a substantial flow of mT air into the system from low latitudes. However, the various numerical models have seemed dry with this system, leaving me to wonder if a more substantial system will move across Arizona than is currently forecast in the 24 to 48 hour time frame. Bottom image shows NAM forecast of 48-hour total precipitation ending at 1200 UTC on Thursday morning - this model forecast keeps all precipitation at higher elevations to our far north. The Atmo run of the WRF-GFS from midnight data appears to have terminated after only a few hours, so the NAM and ATMO WRF can not be compared right now. 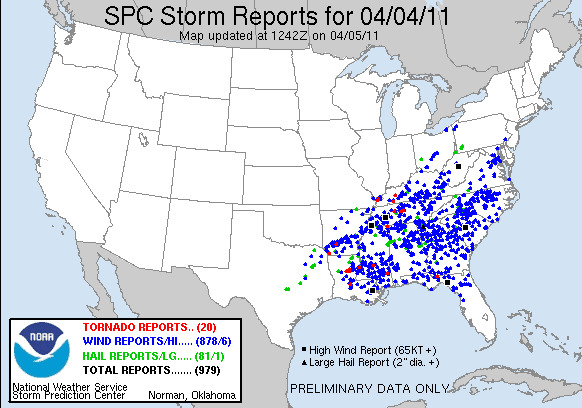 Map above from SPC shows severe storm reports from yesterday, April 4, 2011. There were almost a thousand reports, and this is the most impressive outbreak of severe thunderstorms that I can seeing for quite a long time. The large 500 mb cutoff that has been wandering around out west of Baja for a week or so, will apparently be ejcted and move asross the Southwest during mid-week. This will bring a chance of showers that will depend upon how much moisture comes along for the ride. Out at 144-hours the models are in suprising agreement on another cutoff digging into the Southwest (see the GFS and ECMWF operational foecasts above). The GFS ensemble members have little spread over the Southwest at 144-hours and all of the members predict precipitation in southeast Arizona for the 24-hours ending at 5 pm MST on Saturday the 9th. The GFS ensemble average and individual member forecasts for 500 mb heights are shown below. So, it looks like more chances for a bit of rain during the first full week of April than we saw during all of March. During the past year or so I have noticed that SPC has been issuing quite a few Moderate Risk Outlooks that are very small in area. Some of these, as per above morning outlook today, are actually smaller than the typical severe thunderstorm and tornado watches issued by SPC. So, I have to admit that I just don't understand the logic, purpose, or the science behind such small outlook areas. If someone can educate me, please do.